FRANKLIN, Mass. – Defense has been the story for Franklin through the opening few games of the season with the Panthers holding its first three opponents to only 30 points per game. Much of the attention is on junior center Ali Brigham (two blocks) and her ability (at 6-foot-3) to dominate the paint, but on Monday night against Holy Name (Worcester) it was the perimeter players who stood out. 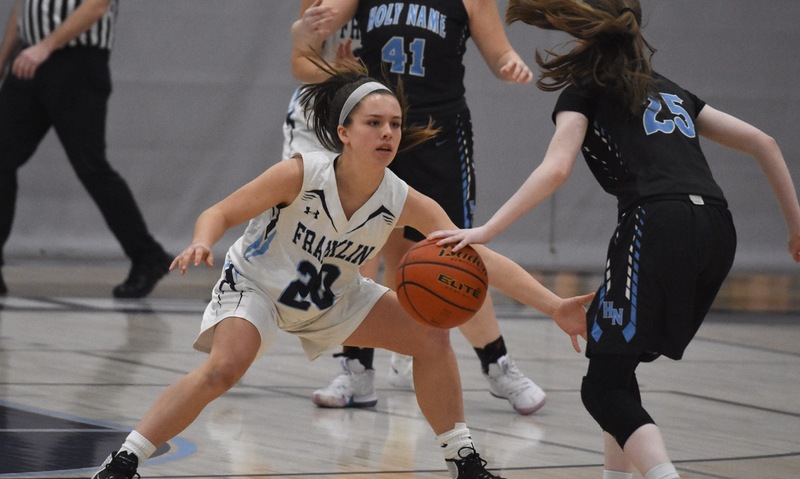 Using a combination of players, including sophomore Erin Quaile, senior Shannon Gray, and junior Breanna Atwood, Franklin held Holy Name’s standout guards Jaini Edmonds and Grace O’Gara to just 15 points combined and the Naps to just 13 points as a team in the opening half of a 56-36 victory. 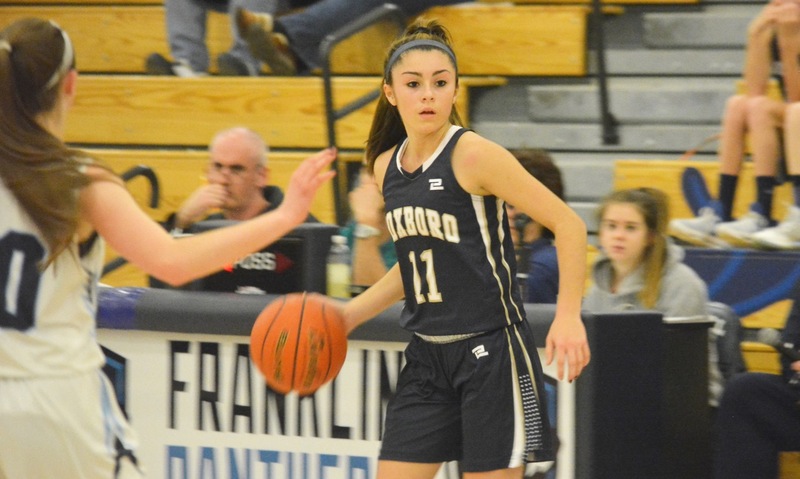 Brigham was the star for the Panthers on offense, scoring a game-high 24 points, pulling down 15 rebounds, and dishing out four assists from the center of the press break and combining with junior Megan O’Connell (nine points) in the high post. She scored 17 of the team’s 26 points in the first half. O’Gara scored her only basket of the night to tie the game at 5-5 in the first quarter but then Franklin rolled off eight of the next nine points to finish the quarter with a lead it would never relinquish. Bea Bondhus (eight points) knocked down three free throws to get the lead then Brigham knocked down a free throw line jumper and scored on a rebound. The Naps scored to start the second but again Franklin put enough stops together to break the game open. O’Connell answered with a layup off a Brigham pass and, after four free throws, the duo switched roles for another easy basket. Brigham scored Franklin’s final nine points of the half, twice getting layups from offensive rebounds. “She’s expanded her sphere of influence because in the middle of the press break we can use her and then on offense from the three-point line to the hoop and she does different things at different times in the games,” said Leighton about Brigham, who recently committed to George Washington. Holy Name tried to put together a run in the third quarter with Edmonds finally getting a few shots to fall and Lilly Krysinski knocking down three jumpers to get the Naps as close as nine points (26-19). Quaile and Atwood knocked down back-to-back threes and then Brigham answered a Holy Name bucket by hitting the glass for a three-point play. Franklin went into the fourth quarter leading by 11 and proceeded to bust the game wide open. Six different Panthers scored in the fourth, including four each for Brigham and O’Connell. Bondhus drilled a three followed by sophomore Elizabeth Wilson, who scored all five of her points in the fourth. It was a dominating performance from the Panthers (3-0), who will try to carry that over on Wednesday when they host Canton. Taunton, 2 @ Durfee, 2 – Final – After falling behind late in the first half, Taunton scored two goals early in the second half to take a lead. Although Durfee leveled the scoring in the 58th minute, it marked the first time someone took a point against the Hilltoppers (7-0-1) this season, and first time a team scored twice in one game. Brett Beaulieu tied the game 1-1 on an assist from Alec Nunes in the 47th minute. Mateusz Hagemajer put the Tigers up in the 54th minute on an assist from Trevor MacLean. Nolan Melo had 15 saves in net for Taunton while Liam Crowley and Charlie Fiske did an exceptional job defensively. Franklin, 0 @ Algonquin, 0 – Final – Franklin had nine shots on net and had a 4-2 advantage in corner kicks but the Panthers settled for a scoreless draw on the road against Algonquin (5-1-3). Breanna Atwood made seven saves in net for Franklin. 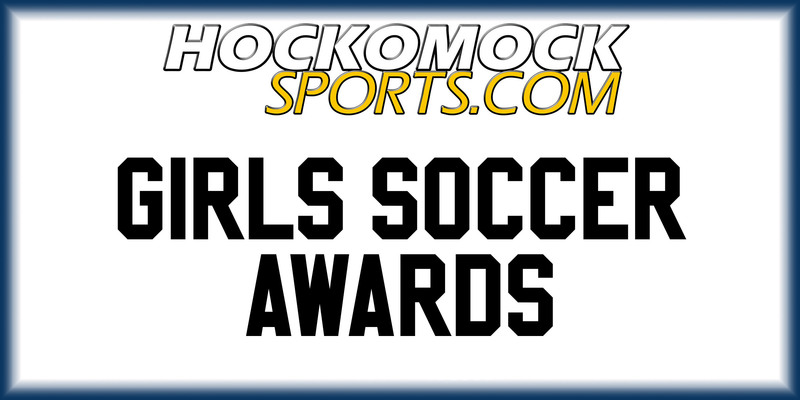 Oliver Ames, 4 vs. Brockton, 0 – Final – Allison Evin, Erin Homberg, Camryn O’Conner and Samantha Gilgan each scored once as Oliver Ames earned a season sweep over neighboring Brockton.